Hot stone massage is a popular complementary therapy for many conditions. During a hot stone massage, smooth, flat, heated stones are placed on specific parts of your body. To prevent burns, there should always be a barrier between hot massage stones and your skin. It’s the position of the American Massage Therapy Association that “massage therapy can be effective for stress relief.” Research supports their opinion. A 2001 study showed that a ten-minute massage improved cardiovascular responses such as stroke volume. A 1997 study found that 15-minute, onsite chair massages in the workplace significantly reduced stress compared to a 15-minute break without massage. A 2015 study found that people who underwent abdominal colorectal surgery had less pain, tension, and anxiety after receiving post-operative massage. A 2006 literature review found massage may be an alternative to sleeping pills in adults with insomnia. The research showed that back massage helped promote relaxation and sleep. A 2001 study showed that infants with sleep problems who were given a 15-minute massage by their parents went to sleep faster. They were also more alert, active, and positive upon awakening. Massage is thought to help you enjoy more restorative sleep, although it’s not completely understood why. 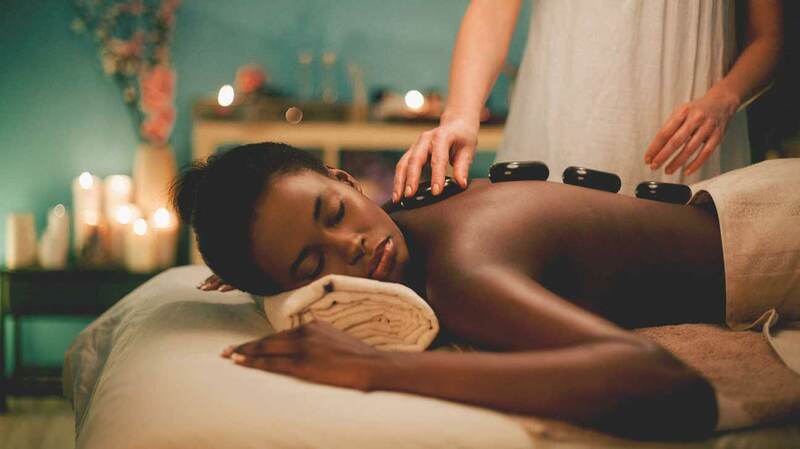 Hot stone massage may relieve painful conditions such as fibromyalgia. Fibromyalgia is a condition that causes widespread, chronic pain. According to a 2002 study, people with fibromyalgia who received a 30-minute massage slept longer, had fewer trigger points, and had decreased levels of substance P (a substance involved in transmitting pain signals) than people with the condition who received relaxation therapy. More research is needed, however, before massage becomes a standard fibromyalgia treatment. A 2013 study found that people with rheumatoid arthritis may benefit from a moderate-pressure massage, such as hot stone massage. Participants in the study experienced less pain, greater grip strength, and a greater range of motion after one month of massage therapy. A large, three-year study published in the Journal of Pain and Symptom Management examined how massage affected pain, fatigue, stress and anxiety, nausea, and depression in 1,290 people with cancer. The study showed massage, especially Swedish massage, improved cancer symptoms, even in those with substantial symptoms. Researchers believe the comforting use of human touch played a role. Massage may give your immune system a boost. According to a 2010 study, a single session of Swedish massage therapy had a positive and acute impact on immunity. Blood samples taken before and after the massage showed a decrease in arginine-vasopressin, a hormone that helps regulate blood pressure and water retention. Who may benefit from a hot stone massage? Anyone who is experiencing muscle tension and pain, insomnia, or stress may benefit from a hot stone massage. If you have a chronic condition that causes pain, talk to your doctor to see if a hot stone massage is a good option for you. A prenatal massage may help relieve stress and ease uncomfortable pregnancy symptoms. Still, most massage therapists won’t use hot stones on pregnant women. If you’re pregnant, you should only get a massage with your doctor’s approval, and under the hands of a trained prenatal massage therapist. Studies show that a hot stone massage may be a helpful way to reduce stress and anxiety, promote relaxation, and ease pain and muscle tension. It may be helpful for a variety of conditions and circumstances. More study is needed to find out exactly why massage therapy has such a powerful impact. It may have a lot to do with human touch. For many people, touch offers a sense of connection and security. To make sure you have a positive hot stone massage experience, only use a massage therapist trained to work with hot stones. You may feel sore during your massage or the day after. This may be due to deep tissue manipulation and pressure. You shouldn’t feel pain. If you are uncomfortable or experience pain during your massage, let your massage therapist know right away.